Can you eat this giant bonza schnitty in one hour? Love schnitzel? Up for a crumbed, golden and tasty Australia Day challenge? Then you'll want to head to the Munich Brauhaus or Bavarian Bier Cafés across Sydney on Thursday January 26. 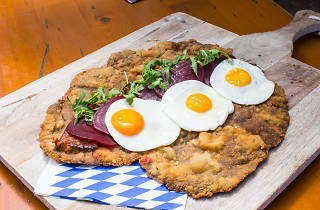 The Big Oz Schnitzelmeister challenge sees one kilo of golden veal schnitzel topped with beetroot and everyone's favourite breakfast combo – crisp bacon and sunny side up eggs. The task – if you choose to accept it – is to finish the Big Oz Schnitzelmeister in less than one hour. If successful, you will receive your mega-meal on the house (usual price: $100), a Schnitzelmeister champion T-shirt, your very own spot in the Schnitzelmeister Hall of Fame and of course, bragging rights. 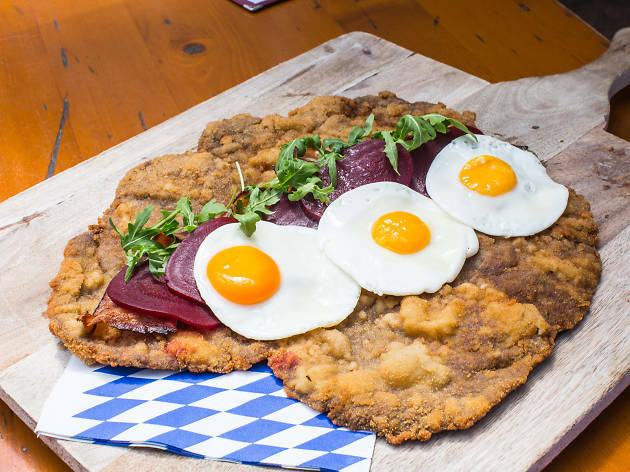 You can take on the Big Oz Schnitzelmeister challenge at the Munich Brauhaus in the Rocks and at Bavarian Bier Cafés at Bondi Beach, Chatswood, Entertainment Quarter, Parramatta, Miranda and York Street.